Six “astronauts” have entered a structure designed by Technion students in order to simulate life on Mars. The building was erected near the town of Mitzpeh Ramon as a first step in the establishment of a space simulation center. 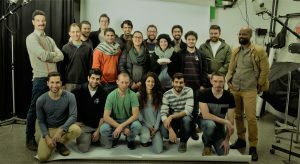 Technion students designed a construction to help simulate human life on Mars as part of a unique course held at Technion’s Faculty of Architecture and Town Planning, led by architects Moshe Zagai and Alon Shikar. The building, named HAB01, was built in Mitzpeh Ramon at the 13th Ilan Ramon International Space Conference. Last week six “astronauts” including Zagai and Shikar entered it in order to learn about life under Mars-like conditions and perform various experiments. Mars has always aroused great curiosity amongst mankind. In the ‘60s, the Mariner 4 spacecraft photographed Mars, and since then many more voyages have been conducted. Furthermore, many believe that Mars will be the next location of human habitation in space, and the likes of NASA and SpaceX are preparing to land the first expedition on the Red Planet. However, conditions on Mars are not friendly to humans: remarkably low temperatures (around 60 degrees below zero), strong ultraviolet radiation, and an atmosphere low in oxygen. These require serious preparation and a thorough understanding of the potential future living conditions on Mars. 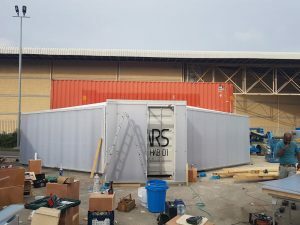 The special course that was held at Technion focused on construction on Mars, and its main goal was to design a structure to house ten people. The course facilitator, Alon Shikar, said that the project requires in-depth understanding of sociological, psychological, technical, and functional aspects. Due to the complexity of the project, which took place within the Faculty of Architecture and Town Planning, students from other Technion faculties were also invited to the course, including Mechanical Engineering and Aerospace Engineering. The building, designed in cooperation with the Davidson Institute of Science Education of the Weizmann Institute of Science, is the first step in establishing a space simulation center near the Ramon Crater.